At Animal Rentals, a large part of our mission is to educate people about our animal kingdom by offering them the extraordinary chance to personally interact with exotic animals. And that education extends beyond just discussing animals in their natural habitat. At our Exotic Animal Shows, College Entertainment programs and Animal Displays, we are often asked about the daily lives of all the different animals that live with us in Animal Library. 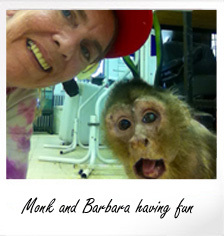 Many people are really surprised to learn that our exotic animals get more care and attention than some people's personal pets - with 24-hour supervision, regular veterinary checkups by renowned exotic animal specialists, and hours spent daily on feeding the proper nutritional balance optimized for each animal's health, bathing, grooming, exercising, play-time and training. As strong proponents of animal welfare, we go the extra mile to make sure that every one of our animals is happy and healthy. Each day at Animal Rentals starts with our animal caretakers washing dozens of food, water and prep dishes. Next comes cutting, chopping, mixing and blending the precise mixture of fresh, whole, raw and vitamin enriched foods for all of the different types of diets in the menagerie. Some of our animals are herbivores, some carnivores, some omnivores, and some only eat live prey. 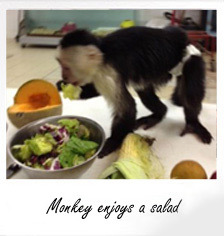 Each individual meal is specially put together for that animal's specific dietary needs. It takes between five and six hours daily to feed, water, and clean the menagerie's living spaces - which are custom created with each animal's comfort in mind and exceed the recommended size and security requirements for animal housing. After breakfast and cleaning is bathing, grooming and training - based on a rotational schedule. Playtime, rest time, human interaction, and animal interaction where appropriate take up the rest of the afternoon. Every working day - which for us is 7 days a week, 365 days a year - is filled with taking care of our animals’ wants and needs. Because Animal Rentals cares not only about our animals, but also about every person that comes into contact with them, we have contracted with two of the most respected exotic animal veterinarian specialists in the United States to keep them healthy and up-to-date on all vaccinations. 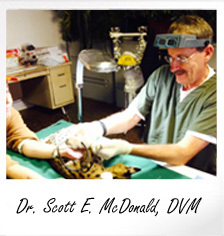 Our primary veterinarian is Dr. Scott E. McDonald, DVM, who is widely hailed as one of the foremost exotic animal experts in the U.S.. He is a nationally renowned avian veterinarian, and has worked extensively with birds, exotic and zoo animals throughout his thirty-nine year career. Dr. McDonald is Animal Rentals veterinarian of record with the USDA, and he visits three to four times a year for health checkups, shots and certifications. 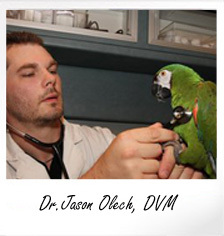 The basic ongoing care of our exotic animals is handled by Dr. Jason Olech, DVM — an esteemed, credentialed emergency veterinarian and exotic animal specialist. Dr. Olech has recently contracted with Animal Rentals to provide monthly complete health inspections of the animals in the Animal Library. That means that every animal we bring to all of our different types of Exotic Animal Shows and College Entertainment Programs has an up-to-date health certificate. Thanks to our dedicated full-time, year-round on-site staff of animal trainers and handlers, and our premier contract veterinarians, Animal Rentals simply has the best taken care of animals anywhere. But don't just take our word for it - see for yourself. Book one of our Exotic Animal Shows and meet the happy and healthy birds, monkeys, snakes, alligators, chinchillas, foxes, tarantulas and other exciting exotic animals at Animal Rentals.